June brought on 223,000 new jobs, and the unemployment rate ticked down to 5.3 percent, the U.S. Bureau of Labor Statistics reported. The unemployment rate in June is now at its lowest point since April 2008, even as new job growth in June fell below the average monthly gain over the past year of 250,000. However, that lower unemployment is primarily due to the 432,000 drop in the labor force, which includes the people who have jobs or are seeking jobs. 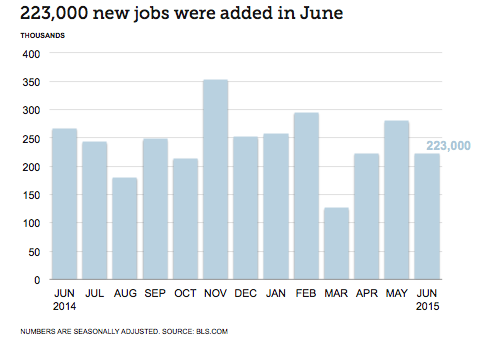 The biggest jobs gains in June came from professional and business services, health care and retail trade. Professional and business services added 64,000 jobs in June and a total of 672,000 jobs over the past year. Of those, employment increased in accounting and bookkeeping services (+8,500), architectural and engineering services (+4,400), computer systems design and related services (+4,400), and management of companies and enterprises (+5,100). Temporary help services added a healthy 19,800 jobs. The financial activities sector also added 20,000 jobs in June, although commercial banking lost ground, decreasing by 6,300 jobs. Employment increased in insurance carriers and related activities (+8,700) and securities, commodity contracts, investments, and funds and trusts (+7,400). The average hourly workweek for employees is at 34.5 hours for the fourth month in a row. Hourly earnings stayed the same in June at $24.95 per hour, only a two percent increase over the past year. Despite new job gains, other statistics paint a less-than-rosy employment picture. Of the unemployed, 25.8 percent have been jobless for 27 weeks or more. And the labor force participation rate, which is the ratio between the labor force and the overall population cohort, has declined to 62.6 percent, its lowest point since 1977. Some numbers suggest that the shrinking labor force is partially due to a lack of younger workers who have jobs or who are actively looking for work. From 1995 to 2013, the number of 15- to 24-year-olds participating in the workforce declined by 11.2 percentage points, according to numbers from Ritholtz Wealth Management. It may be that more people in that age range are in school instead of looking for work.